I've seen a lot of recipes using courgettes that had been spiralised, but was loathe to spend a fortune on a kitchen gadget. When I saw a julienne peeler that created a similar effect, but for a fraction of the cost, I thought I'd give it a try. 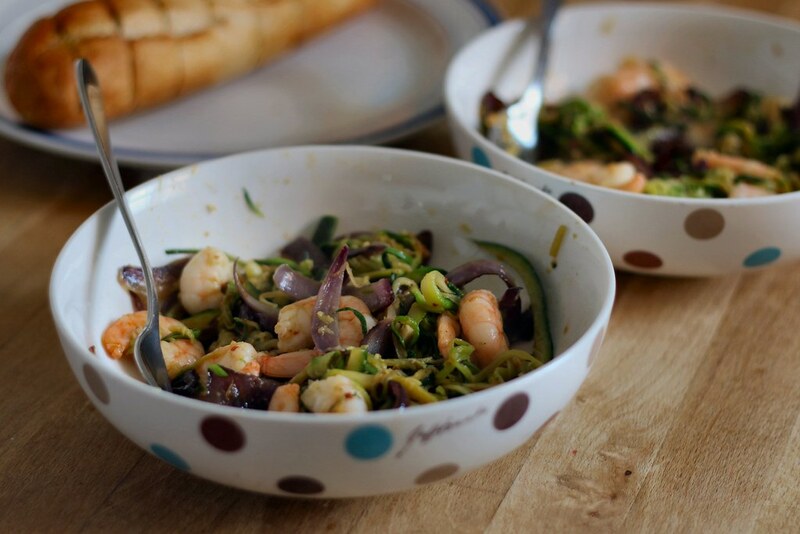 We really enjoyed this lighter way to eat a 'pasta' dish at the same time as using up lots of courgettes! Place the julienned courgette in a sieve over a plate or bowl and add the salt. Leave it for 10 mins or so and then squeeze out the excess liquid. Heat the oil in a large pan and cook the onion until golden brown. Add the garlic and squeezed courgette and stir. Add the red pepper flakes and prawns and stir. Cook for a few minutes, stirring occasionally, until the courgette turns bright green and the prawns are cooked on both sides. Add the lemon juice, stir and then taste and adjust seasoning as required. Serve immediately; we ate ours with garlic bread.